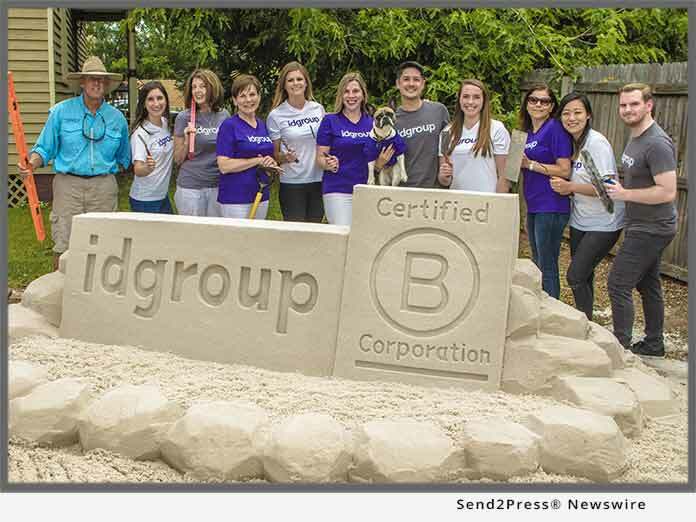 PENSACOLA, Fla., May 03, 2018 (SEND2PRESS NEWSWIRE) — idgroup, a Pensacola-based brand transformation firm, has earned certification as a B Corporation, an acknowledgment of the company’s commitment to social and environmental ethics, transparency and accountability. idgroup joins over 2,200 Certified B Corporations globally-including 18 others in Florida-that have met the rigorous standards that measure a company’s impact on its employees, suppliers, community, and the environment. The firm commemorated the certification by hiring world-champion sand sculptor Rick Mungeam to transform five tons of beach restoration sand into a symbol of corporate responsibility at their downtown Pensacola office. To watch a video the creation of the sculpture, click here: https://vimeo.com/267527460. Certified B Corporations are committed to using the power of business to solve social and environmental problems. In addition to recognizing existing efforts, B Corp certification also provides companies with a community of like-minded business leaders with which to connect, and to continually progress and innovate. idgroup joins a diverse community of B Corporations with members including Patagonia, Etsy, and Ben & Jerry’s. B Corporations are certified by B Lab, a nonprofit organization that assesses and recognizes companies who are voluntarily meeting higher standards of business performance, transparency and responsibility. “idgroup joins a robust community of Certified B Corporations redefining success in business, so that one day all companies compete to not only be the best in the world, but to be the best for the world,” says Jay Coen Gilbert, Co-Founder of B Lab. In addition to becoming a Certified B Corporation, idgroup also became a registered Benefit Corporation in the state of Florida in February. While similar in concept to a Certified B Corporation, a Benefit Corporation must legally adhere to requirements in three specific areas: accountability, transparency and purpose. Earlier this year, idgroup was also recognized with a Fourth District American Advertising Federation’s Angel Award, which recognizes firms throughout the state of Florida and the Bahamas for their contribution and work for public service initiatives and campaigns for non-profits. The firm was recognized for its 2016 rebranding and advertising work with local nonprofit Autism Pensacola, the fourth recipient of Brand on Us(TM), an annual grant which awards a deserving local nonprofit with a comprehensive rebrand worth over $150,000. Learn more about idgroup at https://idgroupbranding.com/. Watch a video of the sculpture creation and idgroup’s thoughts on becoming a B Corp: https://vimeo.com/267527460. 4. Inspiring millions to join the movement through compelling story-telling by B the Change Media. For more information, visit: https://www.bcorporation.net/, https://bimpactassessment.net/, http://b-analytics.net/ and http://benefitcorp.net/. idgroup is a brand transformation company with a fundamentally different approach to branding. Since 1989, we’ve helped leaders tear themselves away from routine thinking, to embrace and leverage branding as an engine for reinvention and innovation. We help engage their stakeholders in fresh, new perspectives to tell and live a vivid brand story, and- as a result-achieve brand clarity and elevate their brand’s value and reputation. Learn more about us at https://idgroupbranding.com/.